Hello my name is Brandi Johnson. I am a burn Survivor. I was burned when I was 18 months old by boiling hot water from off of the stove, as my mom was defrosting the refrigerator. I am now 33 years old and have began to live my best life! Growing up, I suffered with depression and low self-esteem. I was always ashamed of my scars, and tried desperately to hide them from people. The Summer time was the worst time for me, because I never wanted people to see them. When people made the discovery of my burns a few things would happen: whispering, rude comments, or questions. It always made me feel uncomfortable, and sometimes rejected which made me feel sad. I come from a family whom always told me that I was beautiful, or said,” at least its not” Although they tried their best to make me feel beautiful, accepted, and not to be self-conscious, I didn’t know how to communicate what I was feeling or how people made me feel. That was a communication tool that I wasn’t taught! In my teenage years and in my early twenties I found myself in demeaning, degrading, and dangerous situations/relationships all because I had no idea who I was or what I was worth. In 2013 I wanted to die because the pain was too deep, and I had no idea what I was supposed to do about how I felt. I created Bea’ U Culture, LLC, out of pain, and desperation to live beyond what I knew was the bottom. 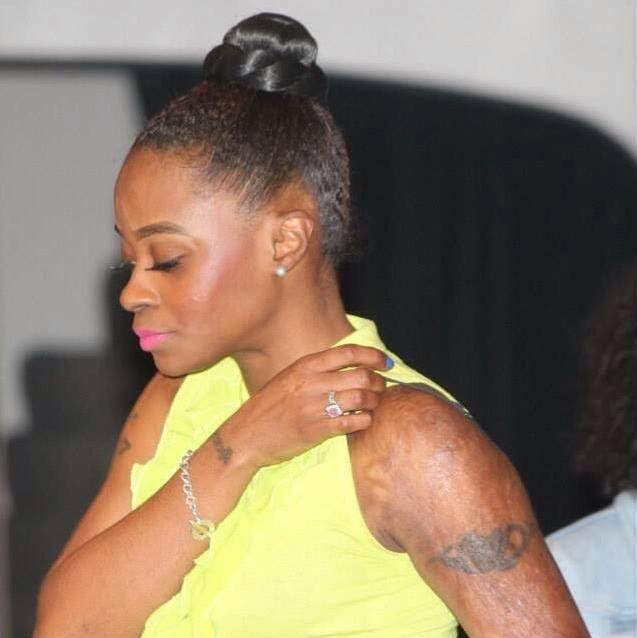 Bea’ U Culture, LLC, is a brand that speaks life to burn survivors. No one truly understands what we go through everyday. We are beautiful and because we survived we have purpose to fulfill and people need us to be the evidence of surviving and living our best lives! Thank you for allowing me to share my story!